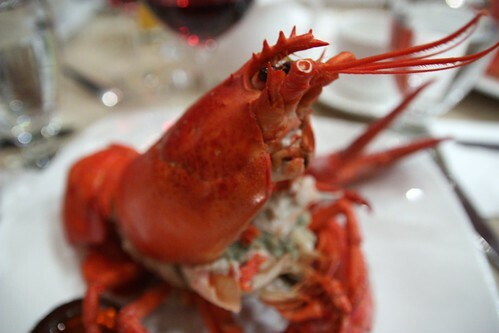 Lobster Fest runs Sundays – Thursdays through June here at The English Inn fine dinning Lansing MI restaurant. This is a thrilling event for lobster fans. Indeed, for those of us who love to eat these peculiar looking crustaceans, there is nothing better than throwing away our dignity, donning a bib, and cracking into a fresh lobster. Steamed lobster at The English Inn - one of the best meals you'll ever have. Lobster Bisque is a standard appetizer here at The English Inn. Prepared with cream, brandy, and sherry, it melts hearts and woos all who taste it. We have also long offered a delicate Lobster Stuffed Walleye, featuring lobster mousse. Rarely do we have whole lobsters. Certainly lobster is a rare treat for many these days. It was not always so. Before Europeans arrived on the shores of America, lobsters were so plentiful that Native Americans used them as bait for fishing and as fertilizer for their fields. Catching lobsters was easy – they could be scooped out of the water along the shore. Colonialists considered lobster to be “food for the poor” – a fact we find astounding today. Prisoners and indentured servants were regularly served lobsters, and tired of eating them. These days, some people would consider spending a few nights in prison if lobster were served. Lobster is best served unadulterated, accompanied only by warm, melted butter. That’s how you’ll find it when you come to Lobster Fest at the restaurant at our Lansing Bed and Breakfast. Hope to see you there, with butter on your chin.